Unless stated to be "Open", meetings are restricted to alcoholics and those who have a desire to stop drinking. 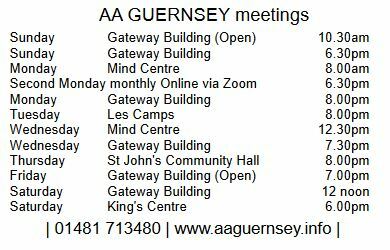 Open meetings may also be attended by others who may or may not have an alcohol problem. Meetings are generally intended for alcoholics and for those with an alcohol problem who have a desire to stop drinking. However, two meetings each week (Friday evening and Sunday morning) are 'open' to non-alcoholic guests, e.g. family, friends, and others interested in AA. Newcomers are especially welcome at our meetings. There is no need to make an appointment—you can simply turn up!